✅ AND POUR AROUND 4-6 LITRES PER 5000 Beads WATER COLD OR HOT DOESN'T MATTER. They will need to be put in water and will need to stay in water for a while until they expand. You will get MIX beads and you will get at least 10 different colours. You can hang the glass vase in the bedroom, living room, office,yard,balcony. Flower Vase Height: Approx. 1Pcs glass tabletop planter. (No plant or other decorative objects included in this item). Material: High boron silicon heat resistant glass. High quality handmade borosilicate glass. Color: Transparent. We are from Japanese Gift Store called Ki-Fu-Ne Japan, and we have Japanese brand tinware called "Nousaku". HOOP is the item made of 100% pure tin which is soft and flexible, making unique crackling sound called Tin Cry. Household rubbish Items General rubbish items Office rubbish removals. RUBBISH & JUNK COLLECTIONin the Fraser Valley.We RECYCLEeverything we possibly can too! Refrigerators Rubbish / Garbage File cabinets. A strategically placed vase pulls the decor of a room together. Vases are made from a variety of materials, ranging from glass and ceramics to wood and stoneware. They come in different sizes, shapes, and colours. What is the purpose of a vase? Vases can have many purposes besides simply holding flowers. Large ones with wide mouths can be used for terrariums or simple fish bowls. They can be hung on walls, and some have their own holders. Some are big enough to stand on the floor, while others simply serve as decorative pieces. Some are used as planters, and many can serve as works of art. Floor vases stand between 20 and 24 inches high and are excellent for holding tall vegetation such as cattails, reeds, and manzanita branches. Crystal and cut-glass vessels add beauty to any room they are placed in. Fill them with flowers, seashells, glass balls, or candy. You can also leave them empty, and enjoy the play of light on their surfaces. Because they come in an array of colours and neutrals, like black and white, they fit into any decor. What shapes do vases come in? Vases are also made in the form of hookahs. They can be rotund, have abstract shapes, or be shaped into baskets, people, or animals. They are pear, barrel or beaker shaped, rectangular, or jardinieres, which is in the shape of a plant container. What are vases made out of? Glass: This includes milk glass. Metal: This can be hammered metal, aluminum, and wrought iron. 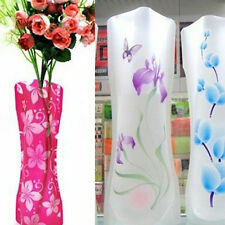 Plastic: Vases can be made of foldable plastic. Mosaic: These pieces are made out of bits of clay, glass, or metal pressed into a medium. Bone china: Bone china is made of clay and bone ash. When a vase made of bone china is held up to a light, it is somewhat translucent. Grasses: The grasses vases are made of seagrass and bamboo, a grass that is treated like and behaves like wood. Rattan: Rattan is made of the woven fronds of a type of palm tree. Stoneware and porcelain: Stoneware is not made out of stone but of clay fired at high temperatures. Porcelain is also fired at high temperatures but has an addition of kaolin to make it especially glossy. Crystal: An item made out of crystal can be carved out of clear quartz, or it can be blown glass with the addition of lead. Terracotta: Like stoneware and porcelain, terracotta is also made of clay, but this clay is fired at low temperatures. It has a familiar orange colour and is porous. Other materials that vases are made out of include wood, seashells, and enamel.